Don’t you just love the muppets? I mean, how cute are they? 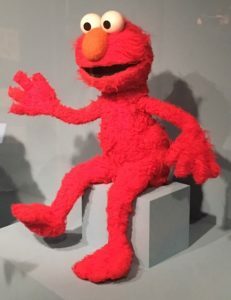 Earlier this week I had the opportunity to see the Jim Henson exhibit at the Museum of the Moving Image in Astoria, NY. It was so cool! I saw Big Bird, Kermit, Miss Piggy, Elmo and other adorable muppets. This really struck me. Jim Henson was so brilliant that when others believed there were four directions – North, South, East and West – he discovered a new one and followed that path. This, to me, says strength, confidence, self-esteem, determination, belief and awareness. 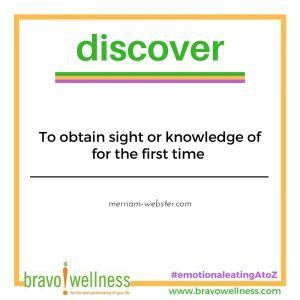 And, of course, our word of the week: discover. Just because something isn’t known, doesn’t mean it doesn’t exist. While this was true for Jim Henson and his creativity, the same can be true for you. Though you may not know something about yourself right this moment, in the next moment you may discover something new. The “a-ha” moment that changes everything! I love, love, love when my clients message me and email me about an “a-ha” moment. Their discoveries are life-changing – once you know something you didn’t know before, you can adapt your habits to support this new knowledge. The more often this happens, the more fun and fulfilling recovery can be. How often do you discover something? You know the adage, you learn something new every day? I love that because if you allow yourself to live in the moment, to stay present, you have more of an opportunity to discover something new. If you are stressed about the past or worried about the future and stuffing your feelings with food, your mind isn’t open to discoveries; it’s stuck. What can you do today to support your body, mind and spirit and discover something new? The answer could be as simple as breathing. Take a deep breath. How do you feel? Maybe you take a walk around the block today. Perhaps you will discover a new building, a new house, a new neighbor. You might even find yourself smiling as you enjoy the fresh air. 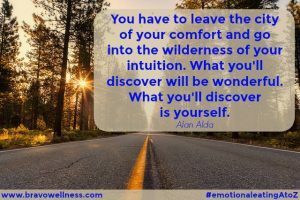 What can you do today to step out of your comfort zone? Contact someone you’ve been meaning to get in touch with but just keep putting it off? Try a new class at the gym? Have fun in the kitchen and make a new recipe? Stand in front of the mirror and say, “I love you.” I know – that last one is a tough one. When you do it, though, you will discover something about yourself. Maybe it’s a freckle. Maybe it’s how much you love your smile. Or, maybe, it’s something so deep and so big that your whole world shifts. Whether the discovery is big or small doesn’t matter. What’s important is that you love yourself and allow yourself to discover something new every day about your beautiful, wise, unique self.